UK Commentators: Any Chemists or Physicists Out There ? Any Chemists or Physicists Out There ? My daughter has a question - and not a bad one, either. 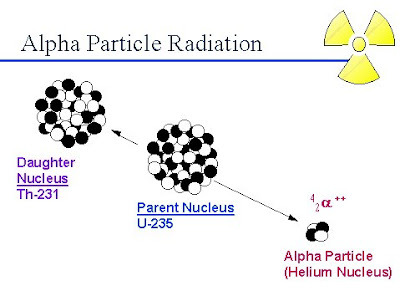 When a radioactive substance decays by alpha emission (I told you she was precocious) , the alpha article is a helium nucleus i.e it has no electrons and a positive charge of 2. What's left has lost two protons - so its atomic number is two less and it's a new element. Uranium has 92 protons (and hence 92 electrons), thorium has 90 protons and hence 90 electrons. Her question is - if the uranium fires out an alpha particle, what happens to the 2 surplus electrons left on the thorium atom ? It's now got 90 protons (having lost 2 in the alpha particle) but still has 92 electrons. It is possible that the two excess electrons associated with the thorium could find their way to the alpha particle and neutralize it, but this would likely not be a one-step process, since the alpha particle is emitted with appreciable velocity and moves some distance away from the decay site before coming to rest. More likely excess thorium charge is transferred to some other atoms or molecules in the system; eventually the alpha particle is neutralized as it picks up two available electrons to yield a neutral helium atom, and charge remains conserved. When the U (Z=92) transforms to Th (Z=90) as a result of alpha decay, the two electrons are lost to the nearby medium. The decay nuclide is like surrounded by similar material, or if at the surface of a solid, it is in contact with air or some gas. Likely though the alpha particle rips away some electrons on its way out of the nucleus, but those electrons are quickly recaptured. As charge particles (alpha and beta), and even gamma rays, pass through material, they interact with atomic electrons and excite or ionize atoms (hence the term - "ionizing radiation"). The range of an alpha particle in solid material is very small - on the order of microns, so it does not travel far from the nucleus from which it originated. Because it has a +2 charge, the alpha particle will ultimately attract two electrons. There will be an effective net migration of 2 electrons along the path the alpha particle took while slowing down. It's an interesting question that whether the atom of the new element now have a negative two charge or does something else happen to these electrons. Electrons are not exactly static charged particles. They have a good deal of fluidity in practice, and in fact one could go as far as saying that they are inherently fuzzy objects, like a photon of light. In most solids (and even in gases) any non-equilibrium electronic state is almost instantaneously readjusted. It's rearrangements of atomic nuclei which take time (so that, while chemical reactions technically involve only electrons, any reaction which requires movement of whole atoms will have a measurable rate). Essentially what happens in a-decay is that the a-particle knocks electrons loose from one or more nearby atoms, then picks up two of the loose electrons to form a neutral helium atom. Meanwhile, the other surrounding atoms (including the "dianion" parent atom -- the scare quotes are deliberate) very quickly reshuffle their electrons in order to have the most energetically stable configuration. This reshuffling energy, by the way, shows up as heat; strong a-emitters like radium are typically a little warmer than their surroundings, and radioactive decay is a prime source of the earth's internal heat. Hope this answers your query. So while the answers make sense in terms of charge conservation, they're all a little vague on the actual mechanics. Does the thorium atom spend time as a thorium ion ? Are the electrons lost by the thorium atom to spend time as free electrons, or do they immediately attach themselves elsewhere ? Or does that depend on what kind of atoms or molecules are around for the elecrons to attach to ? And a question from me - at any time, how many ions or free electrons are around, say in air ? If you drew a virtual metre-square box in your living room, what proportion of the molecules therein would be ionised ? Well I don't know anything about that, but thanks to state education, I know how much immigrants contribute to our diverse society! If the uranium atom were floating around as vapour the decay products would spend sa short time as ions; when they next encountered an atom, electrons might or might not be torn off it to neutralise them, depending on a number of things (energy needed to create an oxygen ion versus energy gained from neutralising thorium ion or helium ion, energy of collision, etc etc). In watery solution (flesh, for instance) it'd most likely smash up a few complex molecules before being neutralised. There are about 6,000,000,000,000,000,000,000,000 electrons in a tablespoon of water so one or two electrons here or there won't show up as a noticeable charge. In any volume of gas there will be ions; how many depends on the temperature. I infer from your quotations that physicists are interested in Physics - what happens in the nucleus, and the goodies that emerge therefrom - but not much interested in Chemistry - what happens to the electrons. Anyway, Chemistry often involves vagueness in general, and instead attention to the importance of specific features of the situation in hand. Consequently the bits you quote seem recognisable to me. In summary, the answer to "What happens to the electrons?" is "It depends". That depends upon what the activist who expelled it has been charged with doing. . .
Sam, that did make me laugh. I think that the electrons do just defuse and link up with an atom later on. An ion may be formed though so I think it depends. I think the last is a little heavy going even for me. My daughter's 12, so something a little simpler may be needed. Of course, 'the truth is never simple' as the Guardian are always telling us.